Bromley is a family friendly ski mountain located near Manchester Center and Stratton Mountain,Vermont. Bromley opened in 1936 and has been geared toward families ever since. Bromley offers great learning programs, a new central base lodge with convenient parking and a good variety of terrain. With affordable midweek/non-holiday lift tickets, Bromley is a deal. Kids will love Bromley’s pigdog mascot, parents will love Bromley’s ski and snowboard camps and on mountain childcare. Bromley’s southern exposure makes it a sunny mountain too. Bromley makes a nice add on with a trip to Stratton, staying at the gracious Equinox Resort at Manchester Common. Recent upgrades to Bromley’s base lodge, improved snowmaking and continued attractive family ski pricing make Bromley a good choice for young families skiing Vermont’s Green Mountains – in white. 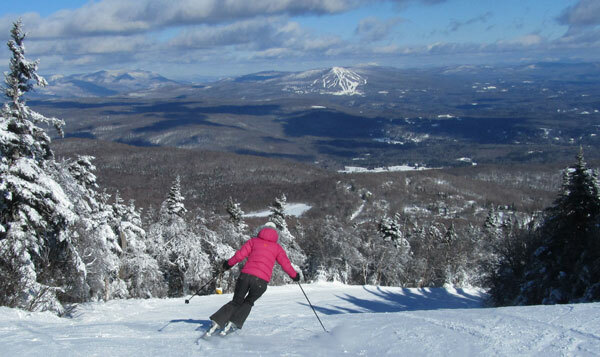 Bromley is a sister resort to Jiminy Peak in Mass, and Cranmore in New Hampshire. Bromley Mountain opened for the 1937-38 season, started by Fred Pabst Jr., of Pabst Blue Ribbon beer fame, it was called Little Bromley – as part of his Pabst Ski Tow business. Bromley was one of the only Vermont ski resorts to stay open during the World War.